Can you welcome friends and family? With these three you can-can! 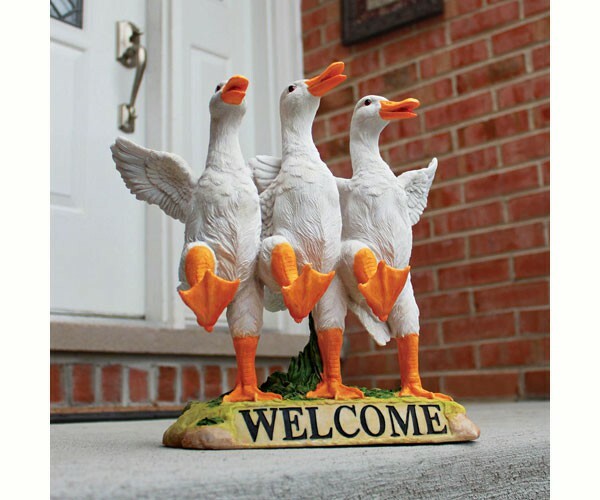 This welcome is sure to "quack" your guests up! Our high-flying, foot-high trio of amiable ducks welcomes with upraised wings and a web-footed kick line. This exclusive animal statue is sculpted 360 degrees and cast in quality designer resin before being hand-painted as the friendliest housewarming or hostess gift this side of the pond! Whether stomping on stage or kicking for compliments, this exclusive bird sculpture will garner praise in home or garden.